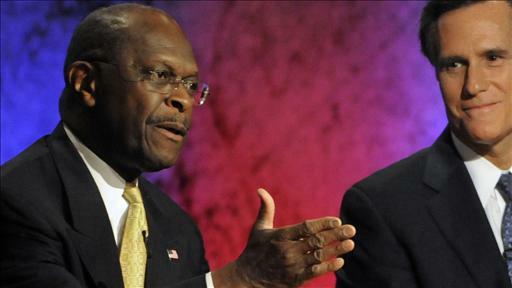 I don't think Cain has a snowball's chance but it is time to look into tax reform and he is the only game in town. Either that or I'm buying pizza tonight...wait, I am. This is interesting and it comes from an economist with impeccable credentials. A new sales tax could be raised int he future--but so can any other tax. And the low marginal rates would jump--start the economy. In the recent past, federal tax revenues from the personal and business income taxes, all payroll taxes, and the capital gains, gift and estate taxes have averaged $2.3 trillion, while gross domestic product has averaged about $14.5 trillion. The total revenue from these taxes as a share of gross domestic product averages around 16%. Sometimes it's a good deal higher, as in the boom of the late 1990s, and sometimes its lower, as in today's "Great Recession." But a number in the 16%-19% range is as good as you'll get under our current tax code. By contrast, the three tax bases for Mr. Cain's 9-9-9 plan add up to about $33 trillion. But the plan exempts from any tax people below the poverty line. Using poverty tables, this exemption reduces each tax base by roughly $2.5 trillion. Thus, Mr. Cain's 9-9-9 tax base for his business tax is $9.5 trillion, for his income tax $7.7 trillion, and for his sales tax $8.3 trillion. And there you have it! Three federal taxes at 9% that would raise roughly $2.3 trillion and replace the current income tax, corporate tax, payroll tax (employer and employee), capital gains tax and estate tax. By making the tax codes a lot simpler, we'd allow individuals and businesses to spend a lot less on maintaining tax records; filing taxes; hiring lawyers, accountants and tax-deferral experts; and lobbying Congress. As I wrote on this page earlier this year ("The 30-Cent Tax Premium," April 18), for every dollar of business and personal income taxes paid, some 30 cents in out-of-pocket expenses also were paid to comply with the tax code. 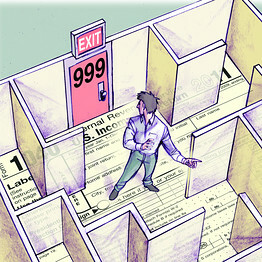 Under 9-9-9, these expenses would plummet without a penny being lost to the U.S. Treasury. It's a win-win. A static revenue-neutral tax change requires static winners and losers. And this 9-9-9 plan has made certain that even on static terms those below the poverty line will be better off—period. Once the dynamics take hold, many of those below the poverty line will find good jobs and thus will rise above the poverty line and start paying taxes. This is the type of tax increase I wholeheartedly support. I support collecting more in taxes from people with high incomes who choose to actually pay taxes at lower tax rates than use lawyers and accountants to avoid taxes at higher tax rates. Some tax revenues at low tax rates is a heckuva lot better than no tax revenues at high tax rates. While the 9-9-9 plan has captured people's imaginations at this moment, it's not all that different from California Gov. Jerry Brown's 13% flat tax when he ran for president in 1992. As you may recall, he came in second behind Bill Clinton in the Democratic Party primary. In 1986, President Reagan passed a major tax-reform bill that lowered to 28% from 50% the top marginal personal income tax rate. The Tax Reform Act of 1986 also raised the lowest marginal income tax rate to 15% from 11% and closed many loopholes, making for a flatter tax structure. Reagan's bill passed the Senate in a landslide 97-to-3 vote. Who says a flat tax can't be a bipartisan proposal? Still, a number of my fellow economists don't like the retail sales component of the 9-9-9 plan. They argue that, once in place, the retail rate could be raised to the moon. They are correct, but what they miss is that any tax could be instituted in the future at a higher rate. If I could figure a way to stop future Congresses from ever raising taxes I'd do it every day of the week and twice on Sunday. Until then, let's not make the perfect the enemy of the good. Mr. Laffer, chairman of Laffer Associates and the Laffer Center for Supply-Side Economics, is co-author, with Stephen Moore, of "Return to Prosperity: How America Can Regain Its Economic Superpower Status" (Threshold, 2010).